Venice has been admired as one of the world’s most romantic and breath taking cities. Known as The Floating City also The City of Water, the city is derived large in part from the fact that it sits upon continuous system of canals. Venice consists of 117 bodies of land connected by more than 400 bridges over its more than 150 canals. The Grand Canal, the biggest one, is like main street, dividing the city of Venice into two parts. The church of of Madonna dell'Orto, located not far from the house on the Fondamenta dei Mori where Tintoretto died in 1594. It is in a largely undisturbed section of the Venetian neighborhood of Cannaregio. Venice is a small, traffic-free city along the winding canals make for great walking. The main public transport in Venice are the vaporetti, boats that ply the principal waterways. We can find many magnificent churches and palaces, lively squares, and interesting shops. Gondola ride is the best way to see many charming scenery along the city, and waterbus ride will take us further a field to larger islands, Murano and Marghera. 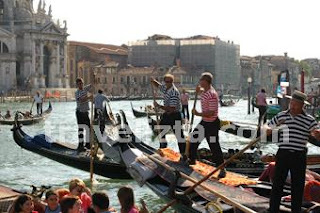 Venice is one of Italy's beautiful cities to travel, romantic destination with bunch of attractions. Venice is best to caught in the middle of acts, after the day trip rush off to beat afternoon traffic, also before cruise ships dump dazed newcomers off in Piazza San Marco in three hours to see all of Venice. Despite the regular floods in the city and mass of tourism, Venice consider as one of the most fascinating, romantic and charming destinations in the world. Venice is located on northeast coast of Italy, protected by a strip of land called the Lido from the Adriatic Sea. Antica Raffineria Hotel is one of cheapest but good hotels in Venice. The region around Venice is called the Veneto. this is the city that you have to visit at least once before die. Venice have flooded the world’s movie with voluptuous music, Venetian-red paintings and wines, bohemian chic fashion and Marco Polo spice-route flavors. Beware, gondolas are a romantic form of transportation in Venice,but today they're used mainly by tourists and can be costly. Search for DISCOUNTED hotel in Venice here!